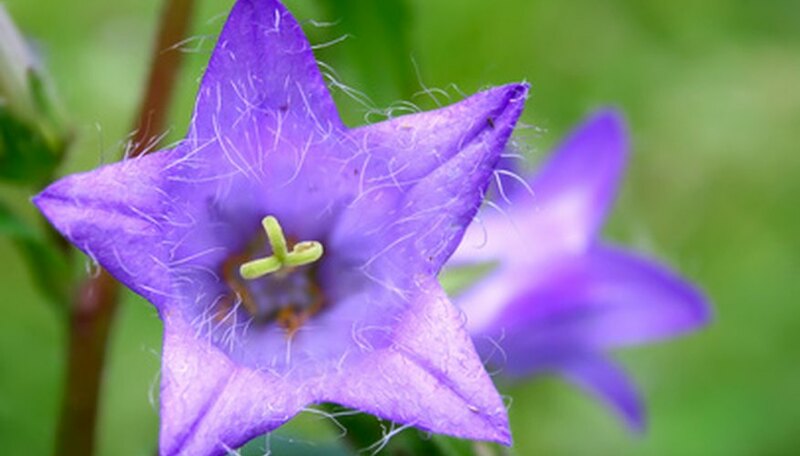 Campanula (Campanula persicifolia), also known as bellflower, is a hardy summer bloomer that thrives in dry, sunny climates with chilly nights. Campanula adds color to the garden with spikes of lilac-blue blooms on top of bright green, sword-shaped leaves. Campanula is lovely in cut flower arrangements, lasting up to two weeks. Campanula is easy to propagate by division after new growth appears in early spring. Spade the soil in a sunny, well-drained spot in your garden. Add 3 to 4 inches of compost, peat moss or manure to improve drainage, then work the soil to a depth of 10 to 12 inches. Dig in a circle around the entire plant, using a garden fork or a spade. Dig deeply 6 to 8 inches from the plant, rocking the tool back and forth to loosen the roots. Lift the campanula clump carefully from the ground. Pull the plant apart with your hands. If the clump is difficult to divide, use a sharp knife, trowel or a spade. Each clump should have several roots and should be of a manageable size, no larger than would easily fit in a gallon coffee can. Plant the divided campanula in the prepared spot. If you can't plant immediately, place the campanula in the shade and keep the roots damp until you are able to plant. Dig a hole no larger than is needed to accommodate the roots and plant the campanula at the same soil depth at which it was previously planted. Planting too deeply can cause the plant to rot. Keep the plant evenly moist but not soggy at all times. Give the plant about an inch of water every week. Check the soil often during hot, dry weather and don't allow the soil to become bone dry. Cut the plant down to approximately 6 inches from the ground, using garden pruners, after the first flush of blooms to produce a second flowering later in the summer. Feed the campanula after cutting the plant down, using a general purpose, water-soluble fertilizer.